The Gtmhub data warehouse is based on PosgreSQL so any functions that are supported out of the box on PosgreSQL are also supported by Gtmhub's insight engine. As with R insights, the main components of an insight are data, algorithm and user interface. To create a SQL insight use the same steps as with writing R insights only change the algorithm language from the insight editor. The language switch is located right beneath the algorithm editing area. We will use the following HTML markup for our SQL insight. 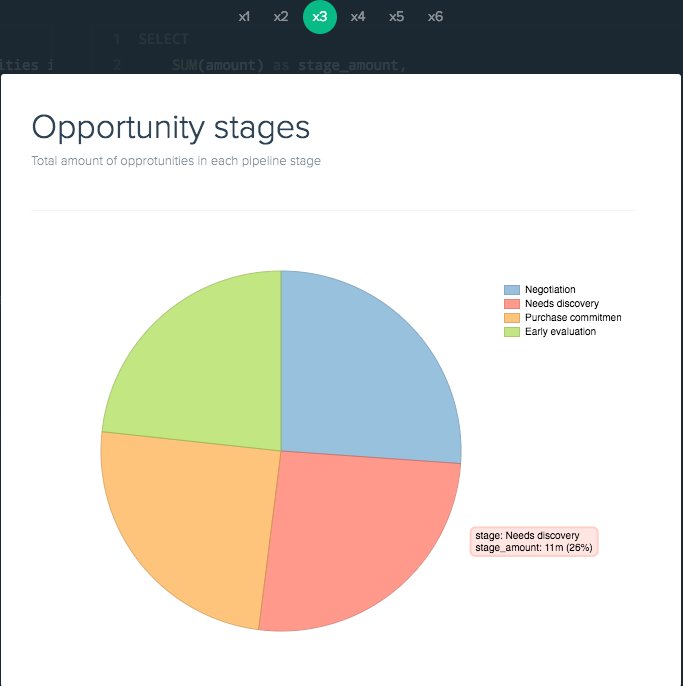 The insight widgets are based on AngularJS so when the insight server responds with the calculated data you the widget will bind the response to the user interface. For the algorithm we will use a simple select statement to select a text from the server and return it as a named column. Executing the insight produces the following result. The Gtmhub insight engine serialises the result from your SQL queries to JSON and binds it to the data object in each insight's scope. When your SQL insights return a single row of data with an arbitrary number of columns the data will be returned as a single JSON object. When your are working with collections of data, the result will be serialised to a JSON array and returned as a child element of data object. In this case your query result will be in data.default . To proceed with this example we will need some real data. The simplest way is to install a demo masterplan, which provides data. The demo masterplan creates three entities: Sales Opportunities, Sales Activities and Employees. These entities are populated with real data from a demo instance of MySql. field-name instructs your Dynamic Key Results which field from insight response to use when calculating your KR progress. name serves as a default title for KRs created from this metric. For the visualisation we will use a pie chart. Gtmhub supports a number of charting libraries, and you can find boilerplate markup for them in the HTML snippets section of the insight editor. In this example we will use dimple. The above markup produces the following insight view. Finally if you need to filter your data based on some input parameters from your insight boards be sure to check out this article: Insights date range filters.